Welcome to beta 2.7.3! The not so minor, minor release! We have hopefully wrapped up the majority of the bugs and issues brought forward with 2.7. But more important may be the balance changes and UI improvements in this release. Our intention with the plant and gardening changes was to create a bit of risk and with the reward of producing large crops, but also to further the watering mechanic which was tedious with little benefit previously. We have had a lot of feedback on that as soon as you produced crops, there was no worry about food. This should adjust that sentiment, at least slightly for now. It was important to introduce something for this that was completely optional. You can plant and gather from your crops just like before, but if you want to continue to sustain life in the same crops, you must tend to them a bit more. Another common complaint was the usefulness of copper. While the original intention was to create a resource that wasn’t necessarily as good iron for the sake of variety and training your skills, it fell short as many players simply skipped the resource entirely in favor of iron. So, now with the previous changes of repairing copper items not requiring fire, differing resistances/vulnerabilities, combined with the changes in this patch (reduced weight and reduced crafting resources), we hope that it can now fill some more niches. We possibly need to stagger the release of beta 2.8 a bit, so there will likely be another large-ish patch for the 2.7.x series to look forward to. Please read below for all the details on the other changes. Added new options for messages, allowing you to configure the log length, whether buttons are visible in the chat row, and whether timestamps should be rendered. Added ability for dedicated servers to be private. Added an option to disable note pinning to the notes dialog. Added an invite game button within the “Multiplayer” menu that will open the Steam friends overlay. Added five additional dedicated server command line arguments: +pvp, +private, +maxPlayers, +turnMode, and +new. Traps will now notify all nearby players of trap misses and reward skill points to the trap owners if they are in view. Watering plants will now increase their health/durability. The gardening skill now provides a bonus reduction of plant and mushroom growth time when watering them. The game’s bindings have been moved to a new “Bindings Menu” accessible from the options menu. The “World” menu and button has been split up into “Modes” and “Multiplayer”. Creatures will now only de-spawn on your current Z level (preventing cave creatures from de-spawning before making your way down there). The focus will no longer be removed from the chat on “enter”, and “cancel” (esc) no longer pauses the game when the chat is focused. The terrain quality is now shown in tooltips. The “Diagonal Movement” option is now named “Alternating Direction Movement”. Item tooltips will now match world tooltip styles in regards to item quality. Renamed legendary items will no longer include their flavorful suffixes. 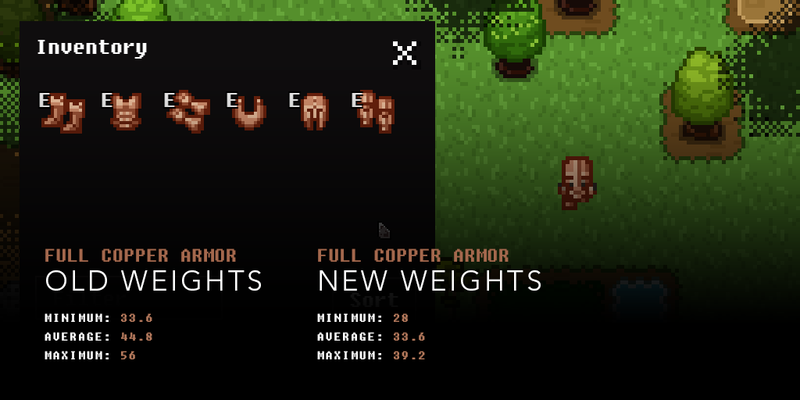 Improved the appearance of icons and many other components in small UI scales. You can now rename games in challenge mode for multiplayer servers. Improved the readability and UX of stat multipliers. Increased difference in color between skill increases and remarkable items. Copper ore now weighs less (on average) than iron ore, reducing the weight of all copper-crafted items. Copper smelting no longer requires carbon powder. Metal chests now require 15 ingots (down from 20). Tweaked the nighttime creature spawning in between -4000 to 4000 reputation so that only easier hostile creatures will spawn. Decreased reputation gain when planting seeds, but increased reputation when watering. Increased chance of digging up resources/items for most types of terrain/flooring. Removed the ability for smaller fruits to produce seeds after eating them (like for raspberries, cucumbers, etc.). They can still be dismantled to produce seeds. Reduced the effectiveness of resting (over sleeping) for stamina regeneration. Resting will no longer provide increased healing benefits (only sleeping will produce such effects). Growing plants on fertile soil will no longer add their full fertility potential on each growth stage. Watering plants with seawater will now harm plants. Harvesting and gathering will now damage plants rarely based on skill. Regenerative effects of plants has been reduced. Decreased lock picking success chance slightly. Fixed the “Welcome” quest not showing up as pinned on a new game start. Fixed merchants not starting with any inventory when travelling to new islands. Fixed tooltips not updating when turns pass. Fixed thrown items erroneously taking 2 points of damage. Fixed bind translations not updating when switching languages. Fixed the messages dialog not closing when moving it to a quadrant. Fixed the join by game code menu not remembering the last game code joined. Fixed some in-game things only being translated after changing the language in-game. Fixed mouse moving causing “janky” movement when pointing at certain angles when diagonal movement was disabled. Fixed tooltips sometimes not working after a loading interrupt. Fixed disabled character slots from unhiding when loading the game. Fixed a hard lock in the death menu when killed while resting, sleeping, renaming, or confirming. The save slots no longer re-order visibly upon opening the load game menu. Fixed menu tooltips appearing in the corner for a split second. Fixed a broken install date showing for local mods. Fixed changing your workshop mod subscriptions while on the mods menu not refreshing the list. Fixed interrupts not being dismissed when disconnecting from a server. Fixed milestones messages being displayed incorrectly on occasion. Fixed English rules being included in other languages (Thanks fenymak!). Fixed disabling a mod that provides the currently selected language not deselecting the language. Fixed changing the mod list between saves causing Registry().get() properties to reference the wrong registrations. Fixed mods with registrations that require each other freezing the game (Thanks Lovefield!). Custom stylesheets are now loaded by path, allowing the sheet to reference resources from within the mod directory more easily. Creatures, doodads, and tile events are no longer required to have descriptions. Added the OnGetTranslation hook for mods to manipulate translations post-interpolation. Command names are now translateable. A silly new language mod. A new mod for those hosting dedicated servers which automatically runs challenge mode games. Fixed the dialog not toggling the tab drawer correctly on open.